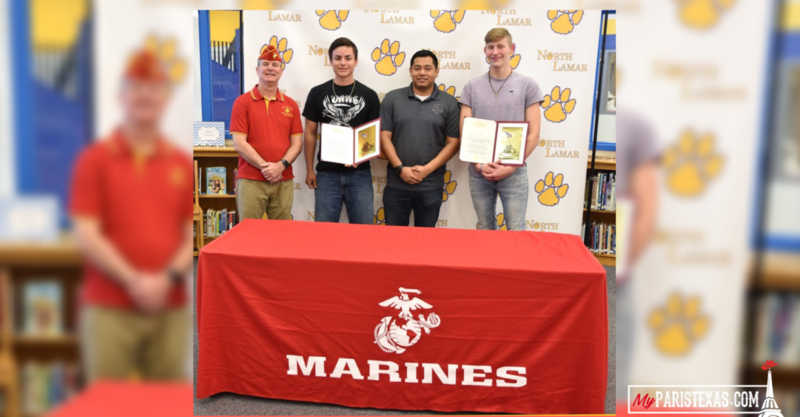 Two students at North Lamar High School will serve in the United States Marine Corps after graduation. Seniors Nicholas Kear and Mathew Aguilar signed before an audience of family, school staff and Marine representatives after returning from Spring Break. Joining Kear as he signs are his parents Sandi and Kevin Kear. Sister Elliana Aguilar, a junior at NLHS, joins her brother Mathew as he signs. Representing the U. S. Marines are Sgt. Nathaniel Daniel and retired Gunnery Sgt. John O’Donnell. High school administrators present for the signing were NLHS Principal Clay Scarborough and Assistant Principal Patrick Fuller.